Ride-sharing companies have long touted the cost benefits of their platforms. Well, depending on the city, it can be cheaper on a weekly basis to take an UberX or UberPOOL than it is to own a personal car, according to Kleiner Perkins Caufield Byers partner Mary Meeker’s 2018 annual internet trends report. In four of the five largest cities in the U.S., it is indeed cheaper to rely on Uber than it is to own a car. Meeker’s analysis took into account cost of gas, car insurance, maintenance and parking. So, if you live in New York City, Chicago, Washington, D.C. or Los Angeles, it’s cheaper to take an Uber. But that’s not the case in Dallas, where the average weekly cost of car ownership is $65 compared to the average weekly Uber cost of $181. 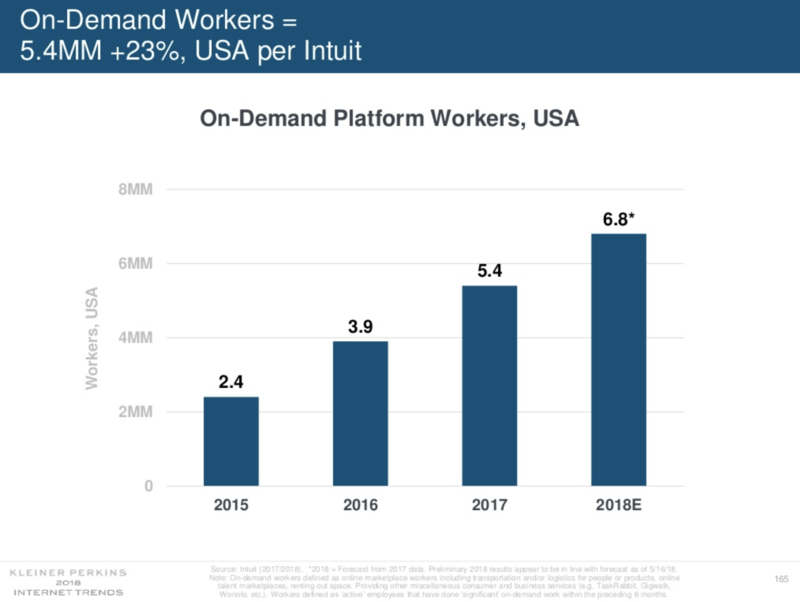 Meeker’s report also looked at the rise of on-demand workers in the U.S. Last year, there were 5.4 million on-demand workers in the country. This year, there are an estimated 6.8 million people working in the on-demand economy. “These are big numbers,” Meeker said onstage, noting how these types of jobs are helping to supplement income for people, provide greater flexibility and improve work-life balance. You can check out the full deck below.